I’m so excited to introduce you this wonderful tent. Most of my readers have agreed and bought it. It’s not only a best 8 person tent but also best Coleman 8 Person tent (IMO). If you want to enjoy an eventful camping trip with your whole family, then the Coleman 8 Person Red Canyon Tent is the perfect tent for you. This tent is large enough to perfectly serve 5-6 men at ago and will give you all the comfortable you need. 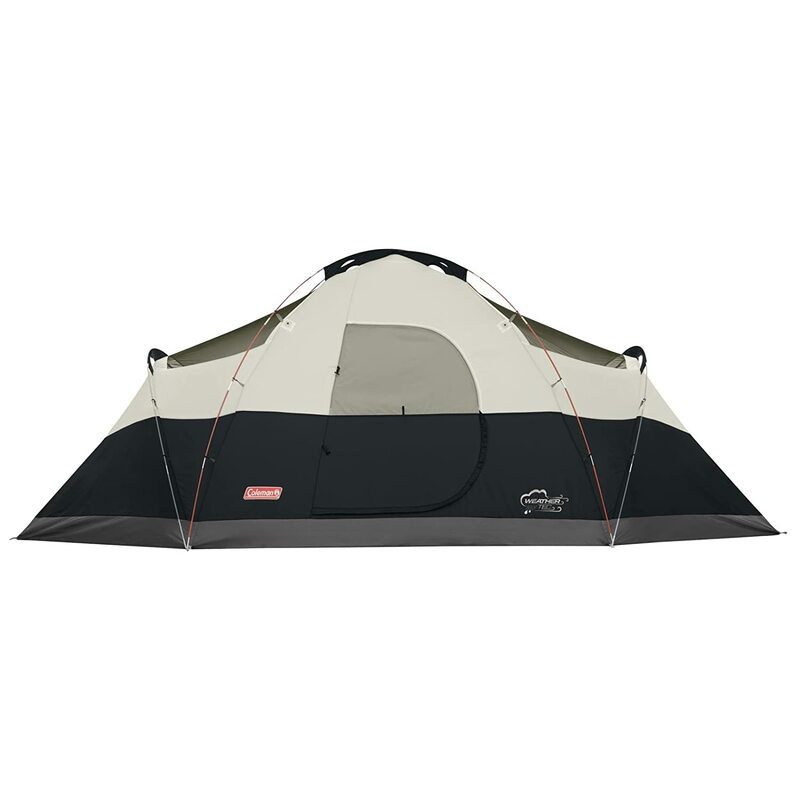 This Coleman 8 Person Tent has 3 color options with Red, Blue, and Black. The Red one is the highest price and the Black one is the lowest. WHY IS COLEMAN RED CANYON 8 PERSON TENT BEST SELLER ON AMAZON? 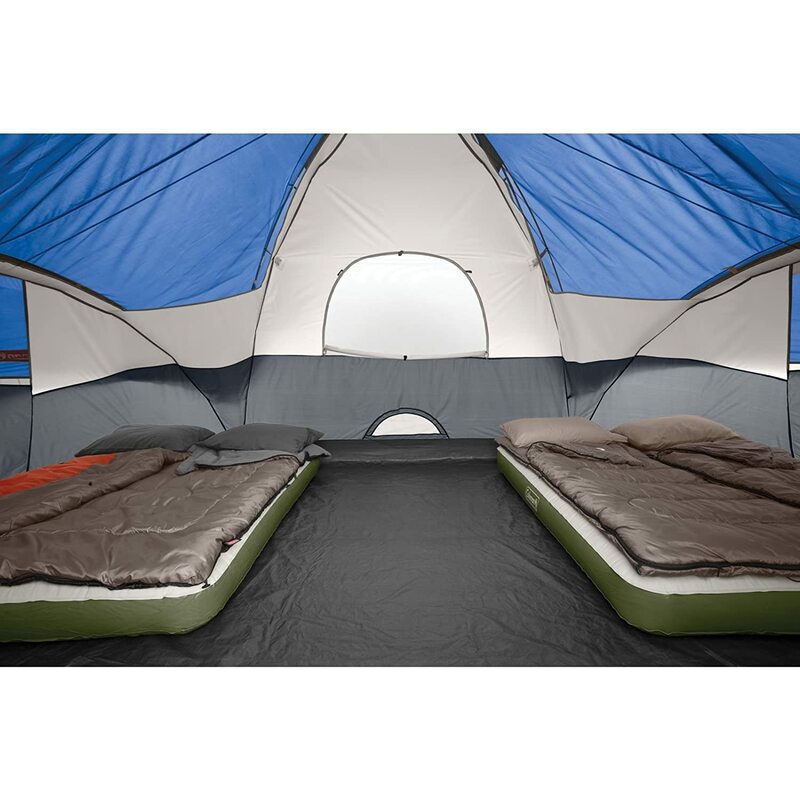 The tent is spacious with a 72 ice height which is perfect for tall people and a 17×10 feet floor. It comes with a room divider that allows for the division to create up to 3 different rooms. This is an important specification as it helps create lots of privacy especially if you have children and adults on the same trip. The tent’s exclusive Weathertec System ensures that you remain dry even if you encounter an unexpected wet condition during your trip. The tent is quite easy to set up as it comes with shock corded poles and has simple and easy to follow set up instructions. This makes it a perfect family tent especially if you have little camping experience. The tent is also designed with a cool air pot as well as a veriflo adjustable venting system which lets you control the airflow in the tent hence the temperature. The Coleman 8 person Red Canyon tent has a unique design that makes it a must have family camping tent. The tent is built with a strong, high-quality, durable polyester-coated waterproof materials to ensure that you are not disturbed by leakages of any kind. The floor is also strong and waterproof which makes it ideal especially if you are camping during the wet seasons. The tent also has a wind strong frame and zipper protections to ensure that you can withstand windy weather conditions. It has a great rainfly with fully taped seams and velcro frame to cover doors and windows thus giving you maximum protection from unfavorable weather conditions. To prevent water from seeping through the floor, the seams on the floor are reversed so that they cancel the needle holes on the tent. In addition, the welding technology is employed to give the floor additional strength. To make the tent stronger, its poles are made strong and wind responsive and are made into guy out triangles so as to ensure that your tent is firmly anchored. The Coleman 8-Person Red Canyon tent is a spacious, waterproof durable and affordable, must-have versatile family tent. It is large measuring about 170 square feet and can comfortably accommodate 8 campers. Given that an average family is between 4 and 6 people, there is plenty of room for everyone. It is also ideal for the family because it can be divided into separate rooms which of a lot of privacy especially when changing clothes. You can also create an extra room for storage of for your pets. Other than being specious the tent is very comfortable. It is made from tough and quality materials to provide a comfortable shelter even in the extremely wet and windy conditions. This heavy duty family tent has waterproof exteriors and well-ventilated interiors to offer you and your family members maximum comfort. The Tents is made with a wide variety of features specifications to ensure that you and your family have a great camping trip. If you are planning a camping trip then this is the tent you should go for. It is comfortable, reliable and quite durable. The Coleman 8 Person Red Canyon Tent performs extremely well in various weather conditions. It is quite affordable for the range of features and comfort it offers. It is large and offers sufficient space for both standing and sleep for even the tall guys. 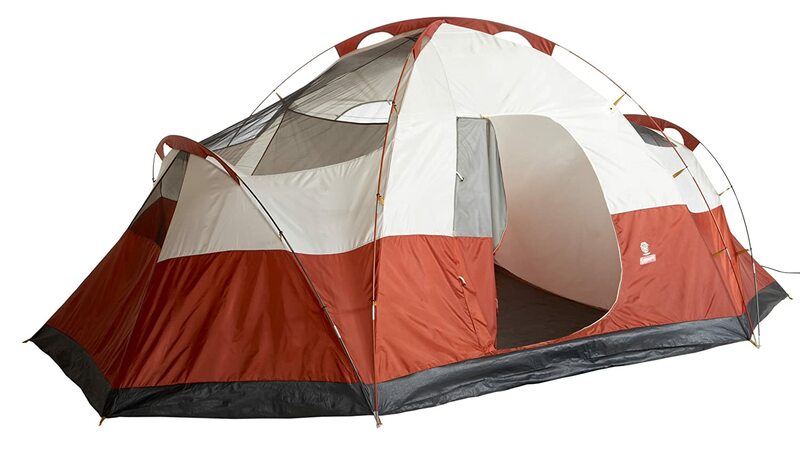 Because of its size, this tent is a popular choice for many families. It can fit is a 2 queen air mattress which makes camping more comfortable. The floor on its part is made with polyethylene materials to prevent water seepage from the ground. The tent frame is made with strong shock corded fiberglass poles that can withstand windy conditions. In addition, they are easy to assemble and hence making it easy to set up and set down the tent. The Coleman 8 person Red Canyon tent is extremely is to set up and maintain. Made with colored poles this tent is extremely easy to follow the setup instructions. In fact, a single individual can easily set up the whole tent in less than 20 minutes. It is also quite spacious which makes it easy to organize and maintain, once it has been set up. The tent also has a gear net attached to the ceiling which gives additional storage space for keys, phones, wallets and torches among other things. The tent also has interior pockets which provide the additional storage facility. The tent is made from weather-resistant materials and has both waterproof floors and leak free seams to ensure that you remain dry even in very wet conditions. For ventilation and temperature control, the tent has cool air gear and adjustable ventilation system to ensure that you get fresh air at all times. It is easy to carry around and set up and thus ideal for a great weekend camping trip. The Coleman 8 Person Red Canyon tent can be suited for many types of users . It is popular with multi small families, a group of friends, and single family with some kids/pets. The most important thing is its very best comfort with high quality and reasonable price. Why Amazon customers said it’s a best tent for camping? 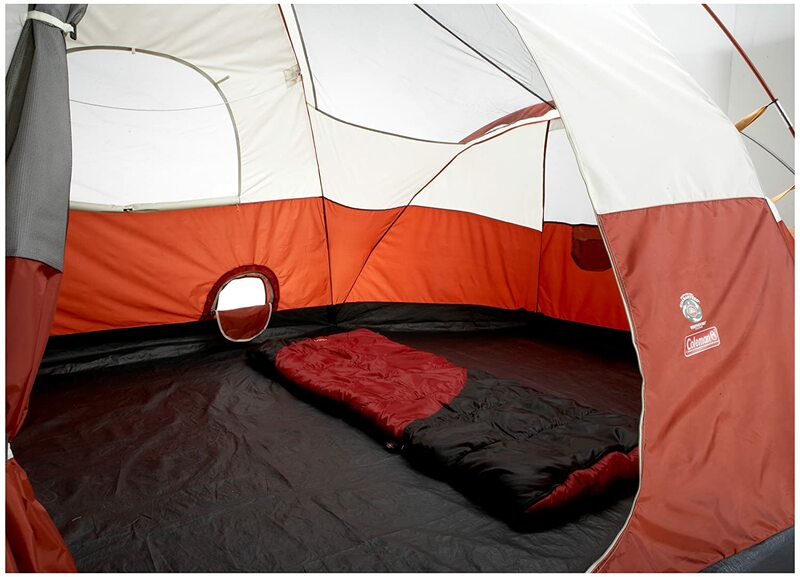 The tent is very spacious and capable of accommodating up to eight people. It is made from high-quality materials and hence very strong, durable and goes at a great price. It has also been commended for being waterproof and having a pleasing and attractive interior. This tent also noted that the tent is quite easy to setup and also to take down and the majority said that they can actually set it up in 10 minutes. Quite a number of customer also noted that the Coleman Red Canyon 8-person Tent did a good job in keeping them dry in bad weather. This is a testimony to the WeatherTec System in this tent that works really well. The Coleman 8 person Red Canyon Tent is built to withstand quite a number of weather conditions. The tent is built with special features to keep off rain water. Such important design features include the rainfly which protects against direct rain, the bathtub shape to prevent stagnant water from entering the tent and the zipper mechanism to make it water tight. The tent also has quite a number of important ventilation features such as the D-shaped doors and the zipper mesh windows that allow free flow of air. On the other hand, the tent has been criticized for being made of poor quality materials especially the poles which are not strong enough in a stormy weather. The rain fly has also been sighted as being poorly designed and thus making the tent less waterproof. Before starting to set up your tent, identify a perfect spot that is level, away from trees, and devoid of tree branches, rocks and any other sharp objects that can damage your tent. Layout your tent by placing the door to face your desired location. While keeping the floor taut, stake door the corners using the stake loops. Interlock the four shock-corded poles to assemble the frame poles by inserting them in the pole sleeves so that the longer red poles cross by forming an X at the center of the tent. To connect your tent to the frame start by inserting a pin at the corner of the main pole and insert pressure on the pole from the opposite end so that it forms an arch and insert another pin on the other end. Repeat the process for all other poles. Using frame clips start attaching the tent to the poles along the tent edges. Make any adjustment to ensure that your tent is tight and water proof. Once you have attached the tent to the frame, it is now time to attach the rain fly. First, you have to assemble the rain fly poles in such a manner that the shock corded poles are interlocked. Then insert he rain fly poles into rainfly pole sleeves. Then you drape the rainfly over the tent frame. Then connect the elastic loops with the fabric loops. Then insert the ends of the rainfly poles in the grommets both at the rear and the front of the tent. Finally, secure the rainfly with the attachments. The Coleman 8 person Red Canyon Tent is a fantastic, spacious family tent ideal for medium size families of up to eight people. This best Coleman 8 person tent is made of high-quality materials to give your family the maximum comfort on your camping trip. It can comfortably house six to eight people at any given time. The tent is strong and completely waterproof and can be used even in adverse weather conditions. It has great ventilation features and can keep you and your family dry and comfortable in any given weather. This tent is also quite easy to set up and use and thus quite appealing to many people without prior camping experience. It is also quite affordable for many families. There are 03 colors (Red/ Blue/ Black) available and the Black one is cheapest. If you are looking for a comfortable, spacious and durable family tent, then this is the tent for you.